These words appeared in 1990 in the first edition of The Black Women’s Health Book edited by journalist Evelyn C. White, who a few years earlier had published Chain Chain Change: For Black Women in Abusive Relationships. This powerful statement along with essays by Audre Lorde, Byllye Avery, Angela Davis, Vanessa Northington Gamble, Faye Wattleton, Marian Wright Edelman, and many others clearly struck a chord: the book gained a large audience, and a second edition was released in 1994. Part scathing critique of racist health care, part meditation on the realities of Black women’s lives, and part “how-to” guide, TBWHB moved between analyses of structural barriers—the kind that cause Black women to be “sick and tired of being sick and tired”—and the sharing of real-life strategies for “breathing life into ourselves,” as Byllye Avery phrased it. I first read TBWHB in graduate school at UC San Francisco, where I was enrolled in the nation’s only doctoral sociology program that emphasized women’s health. Feminist sociologists Virginia Olesen and Adele Clarke were pioneering educators of women’s health in all its dimensions, and they were from the beginning deeply committed to intersectionality. We learned as soon as we stepped foot into the classroom that women’s health meant all women’s health, and not just the health of white women. And because we were studying sociology, we became intimately familiar with structural aspects of women’s health, those obdurate barriers of race, class, sexuality, age, and geography that make some women sicker than others and cause some women to die earlier than others. Thus, we understood then, as we do now, that race matters as much as—and perhaps more than—gender in understanding Black women’s health. Now, more than two decades later, The Feminist Wire is addressing Black women’s health through this collaborative forum. And in thinking through the trajectory of the Black women’s health movement, we knew we needed to talk with Evelyn C. White about TBWHB, its groundbreaking role, and its continuing impact. MJC: What was the impetus for TBWHB? Why did you decide to create the book? ECW: The pioneering feminist publishers at Seattle’s Seal Press approached me and asked if I wanted to write another book. This was after the success of Chain Chain Change: For Black Women in Abusive Relationships…which was my first published book that Seal had released in 1985. I lived in Seattle from 1978-1984. Seal must have made this offer in the late 1980s. By then I was a reporter for the San Francisco Chronicle living in Oakland, California. I told Faith Conlon and Barbara Wilson (the main women running Seal Press at the time) that I wanted to write a biography of Aretha Franklin! They appreciated the sentiment but said that wasn’t what they had in mind. As I recall, they offered me a small bit of money to subscribe to magazines, attend workshops — basically some funds to explore possibilities for a new book. I’d always wanted to visit the historically black all-women’s Spelman College in Atlanta. Somehow I heard that Byllye Avery’s National Black Women’s Health Project was holding a conference at Spelman. So, I used part of the funds Seal had given me to attend this conference. During my few days there, it became obvious that something monumental was happening on a national scale with regard to Black women’s health. The thing that stood out most to me was that Black women from across the economic spectrum had come together to discuss their health issues. There was an incredible energy in every workshop I attended. I returned to Oakland and told Seal that I wanted to edit a collection of essays on Black women’s health and they gave me a contract. MJC: I’ve always been struck by the subtitle, “speaking for ourselves.” Can you talk about this subtitle, and what specifically it’s a reaction to/against? Who has spoken for Black women, and with what consequences? ECW: The subtitle evolved directly from my experience at Spelman. Black women were speaking for ourselves about our issues. I don’t recall any speakers from any other race. Byllye Avery and her then co-director Lillie Allen had galvanized Black women who were front and center in every aspect of the conference. In hindsight, of course, the subtitle was in response to the white medical establishment and its biased views, pronouncements/”prescriptions” about Black women and the status of our health. I think that the main consequence of the historical silencing of Black women’s voices re[garding] our health has been a pervasive stereotype of us as strong and invincible with no physical, emotional vulnerabilities. MJC: Did the book’s structure emerge before you reviewed contributions, or after? And how did you decide on the four sections/themes? ECW: As I recall, the structure of the book emerged organically from the general call for material that I put out primarily through word of mouth and in ads in feminist newspapers such as Sojourner. There was no Internet back then. MJC: In your introduction to the book, you talk about the process of locating authors and texts via footnotes, reaching out, contacts, etc. Can you say more about the emotions you were feeling as you brought all of these wonderful voices together? Were you nervous? Excited? Scared? Energized? ECW: As for my emotional state, I felt as if I had been “called” to edit the collection because the cosmic forces had delivered me to Spelman. I also understood how rare it was then (and now) for a publisher to contact a writer and offer her the opportunity to publish another book. I would say that more than anything else I was OBEDIENT to the spirit voices that were guiding my journey as editor of the collection. As a graduate of the Columbia University Graduate School of Journalism, I knew that I had been well trained with regard to the research/writing demands of the task. MJC: I’ve taught this book in my courses on women’s health. Just like me, my students have favorite chapters/authors. Of course, I love Audre Lorde, but I also found myself pasting post-it notes into Opal Palmer Adisa’s piece, and Angela Davis’s essay, and Faye Wattleton and Judy Simmons’s chapters. Can you talk about your favorite chapters, and why they’re your favorites? ECW: All of the pieces contribute to the overriding message/theme of empowerment that courses through the book. I recall being deeply moved by Vanessa Northington Gamble’s piece about her medical school training and the piece on grief by Bridgett Davis. I loved all the poetry in the book. MJC: What was the reaction to your book among your various communities: family, friends, employer, activist groups, Black women’s health networks, and the public at large? What were the best and worst responses to the book? ECW: I was stunned to one day open the New York Times Book Review and find an affirming review of the book by Linda Villarosa (with whom I later worked when she was editor of Essence magazine). The response to the publication of the book was overwhelmingly positive. I was invited to speak in venues all over the country. Black women would thank me with tears in their eyes. Among the best responses were those from Black women who encouraged me to expand the book and include pieces on, for example, the importance of breastfeeding—which I did in the expanded edition of the book. During a reading at a library in Olympia, Washington, a Black woman who was clearly mentally ill came to spew insults at me. I didn’t take it personally because it was obvious that she was in emotional distress. MJC: I have had students tell me that TBWHB changed their lives, and their thinking about the health of women of color. Did the book change your life? And if so, how? 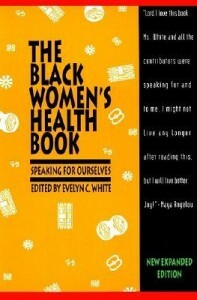 ECW: The book gave me a national profile as an “expert” on Black women’s health. It was a mantle that I did not embrace easily. MJC: Talk about the decision to include the section “Rocka My Soul,” which offers advice, interventions, and a more “hands on” approach. ECW: As mentioned previously, my mission for the book was the education and empowerment of Black women by and for Black women. So “Rocka My Soul”…was a natural part of the mix. MJC: If you could offer one take-home lesson from TBWHB, what would it be? And is that lesson different now, so many years later, than it would’ve been in 1990? ECW: The take-home lesson would have to do with mental health and how important it is (in my view) for Black women to confront our unexamined issues of grief and sorrow. Many of us have experienced premature and/or violent deaths [of] family, friends, and colleagues. I believe that most of us have deep wells of sorrow that contribute to untreated depression and anxiety. I think it is critical for Black women to work with skilled mental health professionals. There are increasing numbers of women of color counselors, therapists, social workers, psychologists, psychiatrists. We need to take advantage of their skills/training and seek professional help. Lack of funds cannot be an obstacle. It has been my experience that mental health professionals will assist in any way they can if a Black woman is serious about beginning counseling. MJC: As I was rereading the book again in preparation for our forum, I found myself feeling sad and angry that many of the structural problems described in the book still exist. My own work is on infant mortality in the U.S., a heavily racialized problem that has much to do with racism and economic injustice. What are your thoughts about why more progress has not been made to secure the health of Black women? ECW: Bottom line: We must be our own salvation. We cannot expect anyone else to be a stronger health advocate for us than we are for ourselves. As for infant mortality, it’s my understanding that most of the factors involved are clear. Pregnant Black women must themselves decide to eat better, exercise more, eliminate/reduce stress. The easiest thing to do in the world is to get up off the couch or chair and take a walk (I’ll be doing the same shortly). It is not hard to eat an apple, an orange (I’m going to peel one now), or a banana EVERY DAY. When many Black women do not think twice about spending huge sums of money on hair weaves, manicures, or the latest fashions, I will not be an enabler on the “I can’t afford to go to the doctor” or “I can’t afford to buy healthy food” front. I’m not having it. It does not cost a penny to take a walk or to execute fifty push-ups. Deep breathing (excellent for stress reduction) is free. Clean water is (or should be) running from every Black woman’s water faucet. Why drink a soda pop? Again, we must be our own salvation. That said, I’m mindful of the institutional de-valuing of black life that has existed since Africans were forcibly removed from their homelands and enslaved throughout the Diaspora. And with that, it is painful, but we must look at the role that other Africans played in the enslavement of their people. White people did not just arrive on the shores of Africa and enslave blacks by themselves. Africans were complicit in and enablers of the slave trade. I’m not talking about blaming the victim. I’m talking about taking a hard, critical look at the reality and complexity of the lives of people of African descent and what we need to acknowledge to move forward. 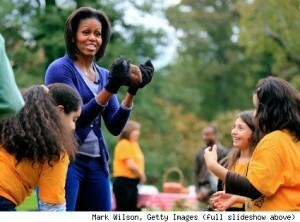 In light of the sublime example First Lady Michelle Obama has set with regard to putting a garden in the White House and making exercise, better nutrition, and anti-obesity efforts a part of her national platform, the discussion/focus on the “structural” issues that prevent Black women from making better choices re[garding] health, diet, must be altered. I cannot, as an “elder,” support (without critical analysis) the mindset that says racism and structural barriers are keeping Black women from delivering healthy babies, from cultivating the healthy lifestyle habits that improve health outcomes from cradle to grave. I am sure there are those who will point to Michelle Obama as part of the “privileged” elite. 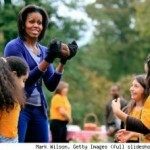 Here’s a reality check: She grew up in a blue-collar home in a black working class enclave on the South Side of Chicago. She made and continues to make choices about her life that have made her, in my view, an example for Black women to follow. Again, for those who feel that First Lady Obama is not an “everyday sister,” I point to Serena and Venus Williams who came straight out of the drug- and violence- scarred community of Compton, California to rise with the encouragement of their Black (and thoroughly eccentric) father to the top of the tennis world. Venus and Serena made conscientious decisions about their diets [and] exercise. Moreover they had a vision (re: excellence) of what they wanted to accomplish in their lives that they did not allow to be undermined by “structural” issues. White society is NEVER going to “come correct” and treat people of color with dignity, respect, equality, as a matter of principle. This is not going to happen. In the meantime, we must not despair. We must work in solidarity with people of all races who understand that all blood is red and that we are all connected. It’s been my experience that people (of all colors) will help those of us who understand that we must first find the courage, the self-initiative to help ourselves. Perhaps there are Black women who are sensitive to what I’ve mentioned re: the willingness to pay outrageous sums of money for hair weaves. Money that could perhaps be better spent (in my view) on joining a fitness center, on buying local, fresh organic food, on paying for mental health counseling. To them, I’d say that there is an excellent documentary Good Hair (by comic Chris Rock — of all people!) that addresses this issue. It is painful to look at the ways in which the white standard of beauty still prevails in the lives of so many black women and girls. But we must examine these issues FEARLESSLY if we hope to free our minds, bodies, and spirits. No white man, no racist “white system/institution” forces a Black woman to walk into a grocery store and buy soda pop. I had the great good fortune of reading an interview with poet W.S. Merwin recently. It was in the Fall 2011 issue of Yes! magazine (www.yesmagazine.org). Actually my partner Joanne Bealy read the interview to me. In it, Merwin said, in part: “It’s important to think about things in large terms — globally and all that. But it’s also important to try to deal with them right in your own life.” With regard to Black women’s health, I’m not saying that racism doesn’t exist. It clearly does. But that fact cannot be a barrier to a Black woman taking a walk, taking measures to prevent unplanned pregnancies, or improving the chances for the delivery of a healthy baby if she does become pregnant. If this interview reaches one Black woman who now has soda pop as part of her daily life and who decides to end that self-poisoning as a result of reading these words, I will feel as if I’ve done my part, as an elder. MJC: Have you continued to stay involved in Black women’s health issues? And what do you see as the major problems now, in the 21st century, for Black women? ECW: With every passing year, I know that I must stay focused on my own health and well-being. I eat well and exercise regularly. I have been and will continue to be in therapy for the foreseeable future. I continue to examine the impact grief and sorrow play in my life. I think it is very important for Black women to have healthy, nurturing supportive intimate relationships. The role of healthy love is, in my view, underrated by Black women—gay, straight, whatever. We need love but not at any cost. We have to make HEALTHY LOVE a priority. MJC: What do you see as both the promises and pitfalls of centering Black women’s health, both in terms of feminism and in terms of anti-racist work? 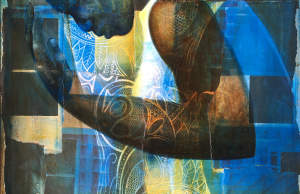 ECW: The promise of centering on Black women’s health is that we can be our own salvation. We can empower ourselves and serve as models for other Black women. The pitfall is similar to that in other aspects of Black women’s lives. We need to learn how to set boundaries, how to say “no,” that it is ok not to save everybody. We don’t have to be rescue workers for anyone other than ourselves. We need to start with ME. All that’s required is that we do our best for ourselves. It is not about being selfish, but SELF-REFERENCED. You can ask anybody in my family (I am the eldest of five). I don’t have an “enabling” bone in my body. MJC: What are you working on now? ECW: While I don’t have a specific writing project at this moment, I think about Whitney Houston EVERY DAY. By chance, I met her late father at a jazz club in NYC in the mid-1980s. It was just as she was rising on the scene. I was in journalism school at the time. I gave him my phone number and asked if I could interview her. Of course, I never heard from him. I have many, many thoughts about Whitney and her vulnerabilities. Like many Black women, she gave way too much to people who did not have her best interest at heart. She lacked adequate protection on so many levels. I believe that her mind, body, and spirit were broken. 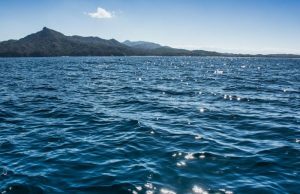 MJC: I understand from one of your bios that you live on Salt Spring Island [in the Canadian Gulf Islands), which has a particularly interesting history in terms of First Nations peoples and settlement of former slaves in the mid-19th century. 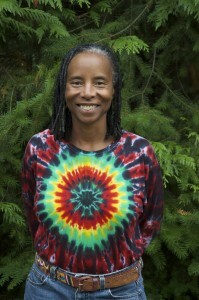 Do you see any connections between your life on Salt Spring and your work on behalf of Black women? ECW: I lived with my partner Joanne (born and raised in Montreal, we are both dual citizens of the U.S. and Canada) for about a decade. There is a thriving Black community on Salt Spring that has been there for more than 150 years. The landscape was very nurturing. I was surrounded by towering trees and glistening water. We had a garden and could also buy or trade fresh produce with our neighbors. I am en route to Halifax, Nova Scotia where there is also a long-standing Black community and a thriving Buddhist enclave. And also, delicious, REAL MAPLE SYRUP (smile!) that I enjoy in moderation on homemade French toast! MJC: Is there anything else you’d like to share with our readers? ECW: I fully embrace the wise words of the sublime poet Gwendolyn Brooks: “My best defense is the present tense.” I make every effort to live in the moment. It is futile to concern oneself with the past or the future. All we have is now. I aim to first be a blessing to myself and then to others. amazing interview and article. Thank you Evelyn and Monica for sharing your words!